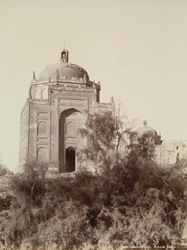 Photograph of the Thahim Tombs at Drakhan in the Shikarpur District of Sind in Pakisten, taken by Henry Cousens in 1896-7. The tomb in the foreground is a tall square structure surmounted by an octagonal drum, a dome and a small lantern. Cousens wrote in The Antiquities of Sind, "These are three large dilapidated structures with a smaller one beside them, all built of brick, with some enamelled tiles still adhering of those that formed a few ornamental bands upon them. Surmounting the domes are lanterns like that on Shah Baharo's tomb [at Larkhana], but not quite so elegant: they are in great part destroyed."